For nearly two decades now, Tower Lifts has been providing a range of specialist lift services to architects, contractors, and building managers/owners. Whatever the problem to be solved, or vertical transport required, we find a way to deliver. Sometimes it’s a simple as installing a standard dumbwaiter lift. Or it can be as complex as installing a bespoke platform lift in a period property. Creating vertical transport opportunities is key to all we do, especially where that means enhancing disabled access. We’re able to do this because of our experienced and creative design team who don’t like to be beaten. Together with our skilled lift engineers we’ve solved logistical problems for big brands and made a grand piano rise out of the ground in an exclusive London hotel. Our operating environments range from small domestic properties to Selfridges Food Hall, and everything in-between. Where we’re installing vertical transport in a new build, or refurbished property, our job is fairly straightforward. More often, though, our installations require bespoke installations. Integrated Platform Lifts: Where access is required up a short flight of steps, or over split level flooring, the integrated lift is ideal. We can create a design which seamlessly integrates with its surroundings, appearing only when activated. The integrated lift can be installed indoors or outdoors. Customised Platform Lifts: These are used in small properties, or ones where there are architectural constraints. Customised platform lifts can be used internally, or externally, and finished in a range of colours and textures to suit the surrounding environment. Do you require a lift upgrade company? Call the Tower Lifts lift team today on 01525 601099 to find out more on our lift services. For building owners or managers with a legacy lift to maintain, lift modernisation is an excellent solution. Rather than ripping out your lift and replacing it with a new model, you can incrementally modernise components. Our lift engineers can assess and report on the condition of your lift. They will make recommendations as to the important areas to concentrate on first. Refurbishment is also a great way to give older lifts a new lease of life. Vertical transport tends to age invisibly with the building. A refurbished cabin interior, or frontage, can equally enliven the building in which it’s located. Your refurbishment may be as simple as a new floor in the cabin, but it will bring the décor back to life, and restore passenger numbers! Ongoing lift maintenance is the best way to maximise return on your vertical transport investment. Tower Lift’s skilled lift engineers will carry out regular inspections to maintain safety and high performance. They’ll do running repairs where possible. For larger repairs, we generate a report and recommendations. Should your lift break down, Tower Lifts will act promptly in order to restore service. Our lift engineers are trained to manage any passengers impacted, as well as attending to the break down. If we can make an immediate repair, we will. If not, we’ll schedule it as promptly as possible to get you up and running again. As one of the UK’s leading suppliers of specialist lift services, we can be relied upon for any aspect of your vertical transport. 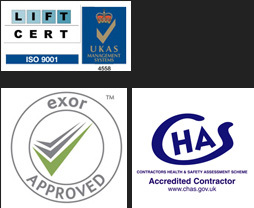 We guarantee that any project we take on will be completed to the highest standards of safety and performance.